Finding affordable financing is one of the greatest challenges facing small-scale farmers. Like any business, farmer co-ops need access to capital until money starts coming in from their sales. Farmers need to make improvements to their land, investments in their crops and purchases that keep their families fed and children healthy. Some organizations will lend to small-farmer cooperatives, even though those loans are seen as highly risky by finance institutions. Nonprofit social investment funds like Cambridge, Mass.-based Root Capital lend to farmer groups at manageable interest rates, but all too often, farmer groups get loans from institutions in their home countries where interest rates can be as high as 25 percent. Interest rates as high as 25 percent will forever keep farmers in a cycle of poverty. So, is there a way to fix this issue? Can North Americans’ enthusiasm for sustainably sourced, high quality coffee be leveraged to help small-scale farmers find financing? Can technology meet savvy consumers to spark a revolution in trade finance? Grow Ahead says yes. 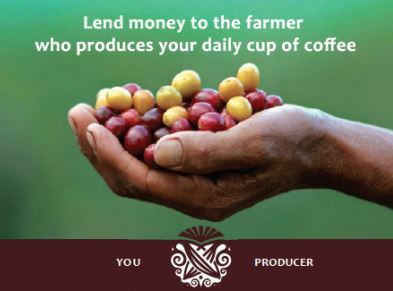 An online (and now mobile) platform for lending, Grow Ahead uses crowd-funding techniques (think Kickstarter) to finance coffee harvests for farmer cooperatives around the world. So, North American coffee drinkers can pick up their mobile phones or log-on to their computers and lend money that will finance the production of their favorite coffees. Pretty cool, we think. Launched in 2012, Grow Ahead loans have financed the production of about 80,000 pounds of coffee at 8 percent interest to producers– half of that total was produced by the APECAFORM cooperative in the Southewestern Highlands of San Marcos, Guatemala, and the other half was produced by the CAC Pangoa cooperative that is located in the central Amazon region of Peru. Nearly $64,000 was loaned to APECAFORM, benefitting some 400 farmers. All lenders on the first APECAFORM loan have been repaid, and full repayment on the Pangoa loan is expected by Oct. 15. Grow Ahead is currently working with APECAFORM again to finance coffee production during the December-February coffee harvest in Guatemala. Grow Ahead will be collecting loans until January 1, 2014, and has a target goal of $50,000. Learn more about how you can lend at www.growahead.org. Got questions about the model? Visit Grow Ahead’s Frequently Asked Questions page.